Landfill waste (garbage) in the dumping waste site (Vilappilshala, Thiruvanathapuram, Kerala, India) has created a lot of problems in terms of health, hygiene and environmental disasters. 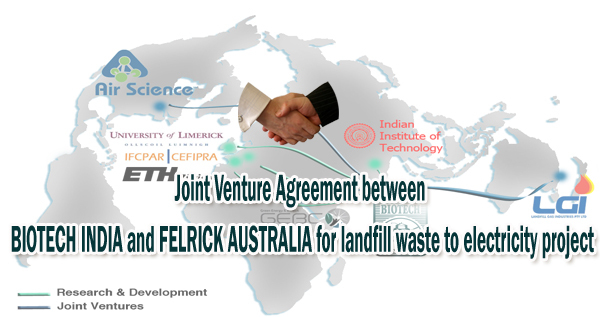 FELRICK (under the license of LGI, Australia http://landfillgasindustries.com.au/) has agreed to associate with BIOTECH INDIA to transfer and implement the landfill gas extraction technology for the landfill waste management in all the Indian projects. With this agreement duly signed, it will enable BIOTECH INDIA to capture all the toxic landfill gas and convert them to electricity and compressed landfill gas (vehicle fuels like CNG) projects. This technology will help to capture and covert the landfill gas to non-toxic clean energy resource and reducing the waste by 80%. BIOTECH INDIA, PB No 520, MP Appan Road, Vazhuthacaud, Thiruvanathapuram, Kerala, India. Phone no: 0471 2332179, 2321909.